Pear is one of the most important temperate fruits, with high genetic diversity, but controversial classification for some genotypes or species. Our study evaluates the polymorphism of 385 pear resources belonging to five cultivated species or interspecies of Pyrus, based on a set of 134 core simple sequence repeat (SSR) markers. A total of 690 variant alleles were detected, from 2 to 12 per locus, with an average of 5.45, as well as 30 rare alleles. The clustering relationship divided the pear genotypes into three groups, with the primary division between occidental and oriental pears, revealing separate evolution processes, followed by division of Pyrus ussuriensis, Pyrus pyrifolia, and Pyrus bretschneideri. Population structure analysis with K values of 2 to 8 reflected a clear genetic composition within different genotypes, supporting Pyrus sinkiangensis as a hybrid of oriental and occidental pears and P. pyrifolia and P. bretschneideri sharing a common ancestor. However, the division of genetic components also revealed separate evolution at the different geographic and environmental conditions of South China and North China. The varieties “Pingguoli” and “Chaoxianyangli,” which currently have controversial classification, were classified into P. bretschneideri and Pyrus communis, respectively. A core collection of 88 accessions was chosen, covering all of the rare alleles and 95.54 % of all alleles. The high-quality and comprehensive evaluation of a wide range of pear cultivars by core SSR markers covering the whole genome demonstrated their excellent application for the study of genetic diversity, genetic relationships, and building a core collection for pear. 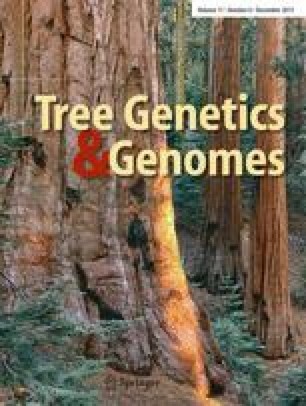 The authors declare that all the work described in this manuscript followed the standard Tree Genetics and Genomes policy. All the primers used were in accordance with the article of Song et al. (2014).